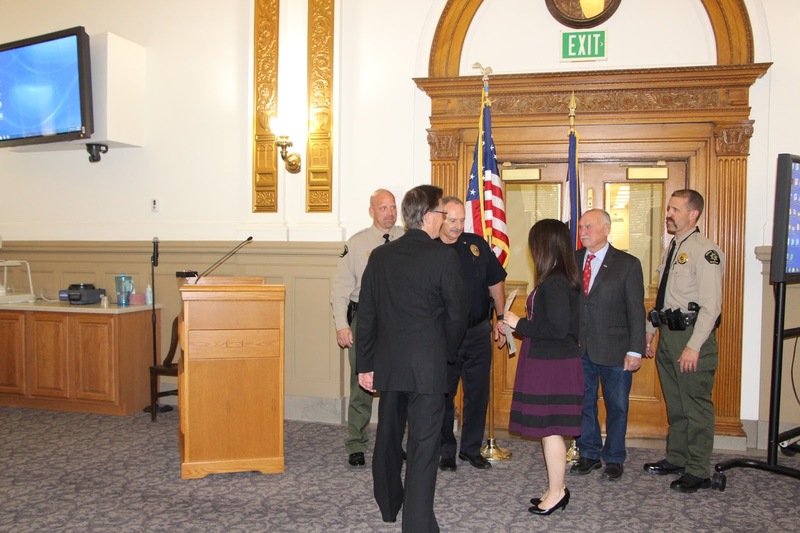 This morning at the administrative public hearing, the Board of Mesa County Commissioners honored law enforcement by declaring May 15-21, 2017, as Police Week in Mesa County. 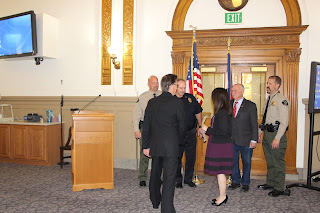 A joint Color Guard of the Grand Junction Police Department and Mesa County Sheriff's Office proceeds to the public hearing room to present the colors in honor of Police Week, which honors the brave men and women who work to serve and protect. In celebration and recognition of Police Week, May 15-21, 2017, a joint Color Guard of the Grand Junction Police Department and Mesa County Sheriff's Office presents the colors. Police Week honors not only fallen law enforcement officers, but also those who put their lives on the line each and every day to protect the community in which they serve. Mesa County Commissioner Rose Pugliese, left, greets Grand Junction Chief Deputy John Zen. The Board salutes the service of law enforcement officers in our community and in communities across the nation. The Board of Mesa County Commissioners declares May 15-21, 2017, as National Police Week in Mesa County. 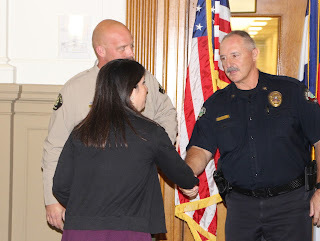 Mesa County Captains Todd Rowell and Art Smith were on hand to accept the proclamation, as well as Grand Junction Police Deputy Chief John Zen. The Board of County Commissioners thanks Mesa County Captains Todd Rowell and Art Smith and Grand Junction Police Deputy Chief John Zen for their service and dedication. Mesa County Captains Todd Rowell and Art Smith accept the Police Week Proclamation.